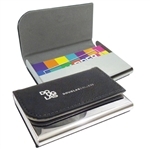 This great gift set for executive travellers include passport holder, PU leather strap key tag, and a luxurious matte pen. 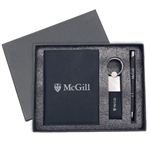 Includes laser engraving on pen and one colour imprint on other two items. Nicely packaged in black gift box. Sueded feel leather like finishing with metal accent and magnetic closure. Holds about 20 business cards. Includes one colour imprint.